This Christocentric approach to Scripture began to erode in the 4th century. Constantine’s Edict of Milan in 313 brought unprecedented religious freedom but with the Emperor’s favor came the baggage of his direct influence. When Constantine called the Council of Nicaea he not merely observed but presided over the proceedings. Constantine’s influence over the church and its doctrine became the catalyst for Christendom. This new era brought an orthodoxy not determined by the appeal to biblical interpretation but to the political power of an imperial decree. “Increasingly the Bible was being read from the perspective of those in power, resulting in readings that reinforced the church’s increasing wealth, sanctified a priesthood-laity divide and consequently established a patriarchal hierarchy within the church.” Pietersen suggests that we should employ a hermeneutic of suspicion to the wealth and power-influenced biblical interpretations of Christendom. A sizable chapter four is devoted to the Anabaptist movement and the way that their subversive approach to Scripture during the Reformation provides insight for the present context. This chapter is key to understanding the author’s reasoning as well as the tone of the After Christendom series since it is sponsored by the Anabaptist Network. The only major movement of the Reformation Era that rejected the use of the state as an arm of the church was the Anabaptist movement. This unpopular viewpoint drew criticism and even persecution from Catholic and Reformed movements alike. From the margins of society the Anabaptists faced a situation not unlike our own where their understanding of Scripture did not require maintaining the wealth and power of the status quo. The author cites four Anabaptist hermeneutic principles. First, Anabaptist theology was Christocentric seeing all of the Bible as pointing to Jesus. They saw Jesus not merely as a redeemer but also as “…the example to imitate and the teacher to obey.” Second, they focused on a communal reading of Scripture. So much of our Bible reading and interpretation is personal today leaving us outside the experience of the early church which received and interpreted Scriptural writings in community. Third, the Anabaptists focused on openness to the Spirit for understanding the Scripture more so than on reason, education and tradition. Fourth, they oriented their understanding of Scripture toward obedience rather than interpretation or knowledge. Their goal was not merely to establish good doctrine but to live out the teachings of Christ within their communities. Pietersen asserts that reading the Bible after Christendom will require all four of these elements. The second section of the book walks through the entire Bible tracing the implications of post-Christendom. Seeing Christ through the construct of prophet, priest and king can reinforce the divide between clergy and laity and focus on authority at the expense of the poor. It is recommended instead that we evaluate Scripture through the threefold lens of prophet, pastor and poet. The author is suspicious of any overarching or controlling metanarrative that aims to unite all of Scripture without paying attention to its distinctive voices. The traditional approach of creation-fall-redemption-consummation, forces a uniformity of voice upon the Scripture that is not found in the text. He does not suggest ignoring tradition but rather paying attention to the little stories while developing our understanding of the great story. In Acts we find a church on mission that adapts its message to each new context it enters. This supports the underlying premise of the book that we need to read the Bible with an openness to how our own unique setting might influence our view of Scripture. For example, the cross is central to discipleship but the call to follow Christ’s example as a servant is easily misplaced when the church identifies itself instead with wealth and power. The strongest point of this section is where Pietersen highlights specific passages that demonstrate how our biblical interpretation is impacted by our changing contexts. His point may have been diluted by attempting to trace his theme through the entire Bible in a book of this size. Focusing on smaller portions of Scripture might have allowed him to more clearly establish his line of reasoning. The third part of the book examines reading the Bible for spirituality and for mission as two contemporary applications of its premise. Three particular approaches are recommended for spirituality. A transformative reading of the Bible looks for its direct application to our lives. A second approach is to learn from the lives of the Scripture’s leading characters. Last a canonical approach combined with a spirituality lens traces the applicational themes that connect various passages of Scripture. Reading the Bible for mission involves learning from our analogous situation to that of the early church that our most effective impact will take place within our social relationships. “Effective mission involves a combination of social networks and attractive, but challenging, lifestyle.” The gospel message must be framed to challenge the idols faced in each cultural context and then lived out by the church to show a better way. Pietersen’s challenge is that we must use our changing circumstances as a catalyst to reevaluate our traditional interpretations of Scripture. His critique of our “insiders” view of the Scripture from the vantage point of power and affluence is timely and poignant. Interpretive challenges will continue to spring from the global expansion of the church into parts of the world that lack the societal support for Christianity that we have enjoyed in the West. We must not allow the lingering effects of Christendom to cause us to ignore the more radical aspects of the gospel. 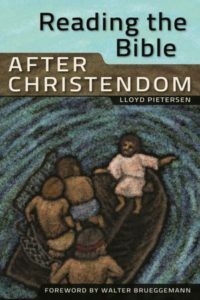 Pietersen has provided key insights that in changing times will help us to evaluate the way we read the Bible and understand its message to our communities after Christendom.